If you are thinking of making your relationship a lifetime comment with that very special person this year, say it with a statement engagement and wedding ring. Coloured gemstones featured in an engagement and wedding ring says how lovingly unique you think your relationship has become. Ring designers are featuring colour this year in a variety of stones. Here are some excellent choices you may want to consider. The first colour that comes to mind when we speak of sapphires is a brilliant blue that is rich in colour. Actually, sapphires come in many colours; the rarest is pink with an orange cast from Sri Lanka called the Padparadscha. Other colorus include purple, orange, green, clear, pink, yellow, and black. Diamonds rate a hardness of 10 on the Mohs scale. The hardness of this stone is 9 which makes it strong enough for everyday use. Using diamonds as an accent will offset any quality sapphire to its most brilliant, making a beautiful statement about your love and commitment. 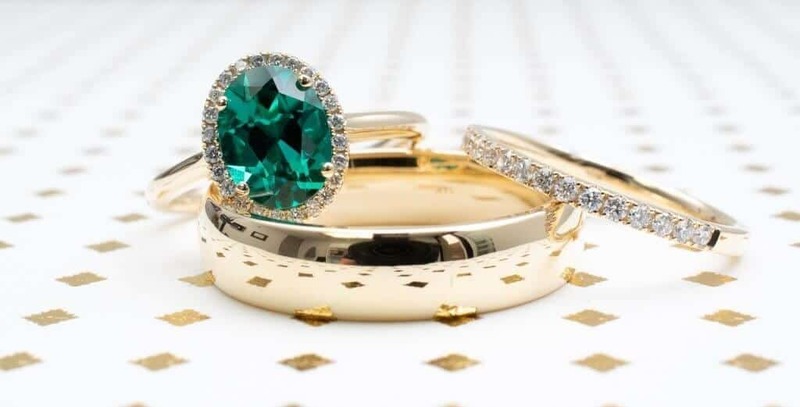 The rich green of an emerald is outstandingly beautiful when enhanced surrounded by the sparkle of diamonds. The contrast makes a bold design statement which will be noticed when wearing the ring. The best emeralds are free of inclusions that can be seen by the eye as visible inclusions may dull the stone. Most of the emeralds we see today on the market come from Columbia. They range from 7.5-8 on the Mohs scale for hardness. Emeralds have a long history of being used in engagement and wedding jewellery. The lovely tourmaline wears very well with diamonds. This tone comes in a variety of colours including purple, green, orange, yellow, red, pink, black, blue, white, and brown. The Paraíba tourmalines are the most desirable. Tourmalines range tremendously in value as a well-colored stone can be very affordable or costly depending on the type. Their hardness on the Mohs scale is a 7-7.5 Love can be stated in many colours so pick your future mate’s favourite one. The most common idea of a garnet is a reddish stone with a pink or brown cast. However, one of the rarest garnets is the green Demantoid. Garnets are found in orange, purple, pink, and yellow. They range in hardness 6.5-7.5 on the Mohs scale. Diamonds are an excellent complement to the more fiery garnets which makes a statement about your passionate relationship. The rarest and most valued colour is the orange-yellow Imperial Topaz. Topaz is another stone that comes in a variety of colours such as clear, blue, deep red, pale green, pale grey and a rare pink. Diamonds make the perfect accent to bring out the brilliance of the topaz. 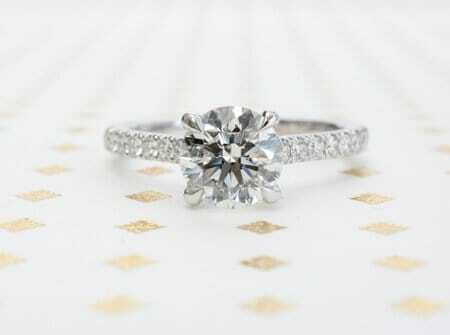 It is an 8 on the Mohs scale and will wear well. Make your engagement ring an Imperial statement. These are just a few suggestions showcasing stones of colour trending during 2018. Whether you are using a diamond as the center surrounding it with coloured stone or using a coloured stone as the statement surrounded by diamonds, there will be no doubt about your level of love. Make your statement a bold and colourful one.